Ivy plants are often chosen because they are tolerant of typical conditions inside of a house. Despite their hardiness as indoor plants, sometimes they need special attention to help them thrive. Reviving a struggling ivy plant isn't especially difficult. Is the Soil Too Dry? Water the plant at the soil level until the entire surface is wet and the water drains out of the pot bottom. Place the ivy plants onto a tray of wet pebbles to raise the humidity level. Filter the light. Use a curtain on a southern or western facing window or move the ivy plant to a northern or eastern window. Move the ivy so it is 6 to 10 inches from a fluorescent bulb. Add a heavier soil to retain more water. Mix one part topsoil, one part sphagnum peat moss and one part perlite. Repot the plant into a pot that is slightly larger than the previous pot when the plant is top-heavy, root-bound or remains too dry. Is the Ivy Plant Too Wet? Replace the soil with a soil-less potting mix that will drain well. Test the soil before watering it by touching it with a finger. Water only if the soil does not feel wet. Does the Ivy Plant have Insects or Disease? Examine the ivy plant for yellowing, browning, specks, waxy mounds or honeydew on foliage. Wash the plant periodically to remove dirt, dust and insects. Use 1 gallon of water and a few drops of dishwashing liquid. If there are yellow specks on the plant, wash three times per week, as this indicates the presence of mites. Rinse the plant after washing. Remove dead leaves from the plant regularly. Remove any infected areas from the plant if there is honeydew on the foliage. This indicates aphids are present. Apply miticide if there are yellow specks or webs on the plant. This indicates a mite infestation. Wipe leaves with 70 percent alcohol and rinse if there are brown, waxy mounds on the leaves, smooth oval specks or white cotton-like mounds. The brown, waxy mounds indicate scale, and the smooth, oval specks or white cotton-like mounds indicate mealy bugs. Do not let ivy pots stand in water. Overwatering leads to lack of growth and susceptibility to insect attack. 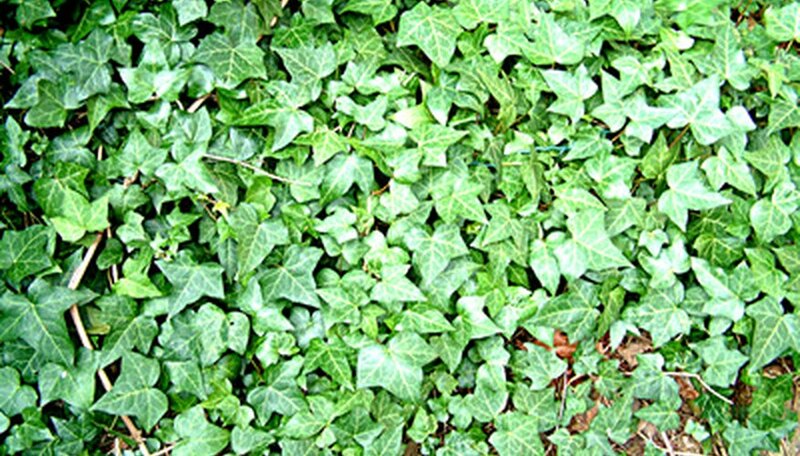 Feed the ivy plant once a month with high-nitrogen fertilizer. Do not put plant food on leaves. Do not feed in hot summer heat or under cold conditions. Using a pot that is too large or one that does not drain properly can lead to root rot. Clay pots dry out faster. Always soak clay pots before repotting to avoid drying out the soil. Always transplant into moist soil. Protect the soil when washing the plant by using foil or a plastic bag around the base of the stem. Always follow the manufacturer's instructions on fertilizer or insecticide (miticide). Do not apply insecticide in the kitchen or on a surface where food is prepared.